Here is another of Pautrot's small bird studies, this time it is an angry Sparrow with all his feathers puffed up. He flaps his wings and opens his beak to tell off whatever has annoyed him. Sparrows are bright and fiesty little birds and will often take on much larger birds in defense of their nests and over food. 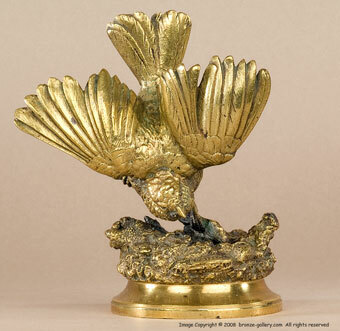 This Sparrow has a gold gilt patina which Pautrot used on many of his bird sculptures. The gold color shows off the fine details much better than a brown patina does. 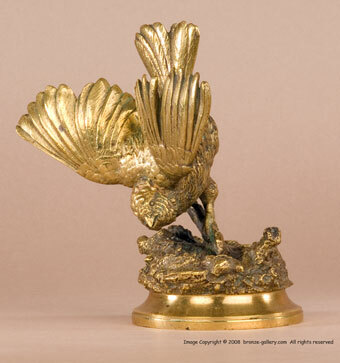 A well detailed small bronze that would go well on a desk or in a cabinet.